I'm of course talking about dretch floor head bite and strafe-jumping. They seem to be good for nothing (except making the game less playable without the knowledge of them). What significant benefits do these have over common sense friendly mechanics? - Have only two damage areas: head and everything below it. - Make so that dretch, mantis and marauder have to jump or wallwalk in order to score headshots. - Make marauder accelerate just by jumping, without all of the strafing nonsense. Headbites: just aim up. A good angle to aim up is at around 45 degrees above the horizon (i.e. from straight ahead). If a human gets too close just aim up further. The lowest you want yo crosshair to be is perhaps 40 degrees or else you will risk biting the torso instead as the human gets into range. Strafe jumping is a seperate learnable skill that will apply to all aliens, humans to limited extent (stamina) and quake 2/3/champions/WarSow/Xonotic/Reflex Arena etc. Here is the very basic concept of strafe jumping mathematics. You don't have to leanr it this specific way, but this way will give you the exact angles you need assuming you have unlimited framerate. There was a better website called FunEnder which had the calculations in regards to framerate penalties but I never really looked into their page much and their website was down before I knew it, so I had to re-do some of the calculations and placed them into an excel spreadsheet which you can download (on the page linked). But in a nutshell, to strafe jump, download this map and paste it inside the folder containing similar pk3 files inside your Unvanquished folder. in the console by pressing Tilde (~/` key next to the "1" on U.S. standard QWERTY keyboards or between SHIFT and / on older PS/2 windows 95 style keyboards) and press enter. It will start up the map with cheats enabled. Spawn as dretch on Aliens and ignore the pot holes, go around them and behind a wall there is a blue teleporter, walk into it. Go to the right hand lane and align yorself with a wall and just hold W key. Slowly turn your cmaera into the wall and look down (so you can see the edge between the slippery floor and the wall). Notice yor speed will increase. Turn the camera slowly but just fast enough to maximise your accelerate rate. The angle which you should be using is equivalent to the angles listed in the excel spreadsheet linked above (e.g. 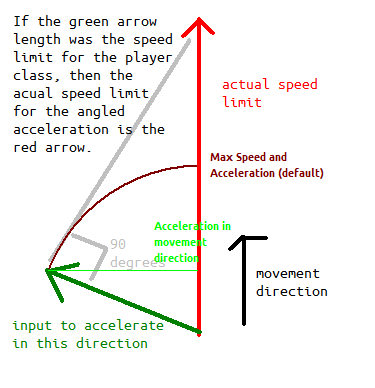 if you want to double your max speed, aim 60 degrees to the side from the forward direction) but this will mean yo acceleration is half of your normal air acceleration rate. Experiment wit ha bit more, and you'll eventually get a feel for it. The slippery effect basically emulates you being in the air because solid slick and air both have no friction. The wall prevents you from turning (as if you are doing it without a wall, you will need to switch directions to maintain an approximate straight path). -The human damage regions can be simplified to three areas: Head (1.5x damage), Torso (1.0x) and Legs (0.5x). I haven't checked the armour values for light and medium armour in unvanquished yet, but in older Tremulous versions, there was a front, back and side regions in the light armour although the regions didn't necessarily work properly. However in a nutshell, light armour in unvanquished has something like 0.5x modifier, while medium armour 0.4x, and battlesuit 0.3x. This means that as a tyrant dealing 150 damage to the head of a battlesuit containing 334 equivalent health, it will take three hits to knock out a battlesuit and the battlesuit will read 10 hp left or something after struct twice at the head. In tremulous 1.1 it was 0.4 for helmet light armour(in general) and 0.2 for battlesuit but they had double damage for headshots. ViruS wrote: Technically those aren't cheats. They totally are, but they've been kept because players would complain if they were to be removed. See how much text did this take to explain? Can someone tell me why keeping these cheats is better than replacing them with common sense friendly mechanics? lamefun wrote: They totally are, but they've been kept because players would complain if they were to be removed. They are cheats, but they haven't been kept because players would complain if they were to be removed, but because it introduced a skill that can be trained along the time the exact same way a sportman is training himself. These cheats were so good to build-up a competitive scene it would have been a very big mistake to remove them. People had to train themselve and exercise these skills the exact same way a sportman has to train himself and exercise his skills, that's why these cheat worked so well and were never removed. That's why, in fine, players would have complained if these movement mechanism were removed, destroying a very exciting, rewarding and effective kind of competitiveness. By the way, this kind of movement and skills makes a lot of sense in games like Xonotic, I'm totally OK to implement or keep things like that in Xonotic, but I'm not very sure about it for Unvanquished. Unvanquished is not a twitch frag game, neither a twitch capture the flag game. You can't win an Unvanquished game doing the bigger number of frags or reaching another base and returning the fastest possible. Unvanquished is a twitch real time strategy game with resource and territory management and subjective close combat. If those hacks are not there, nothing is removed from the game. So I don't have opinion about removing or not these hacks. They can be kept since it allows people to learn some skills, which is always rewarding, but I don't like how complicated it is and if someone wants to remove it I will not myself veto it. I don't know what others think about it, though. On the other side, dretch head bite is a really easy skill to practice, and it's very good to keep this mechanism, for the simple reason that aim-based gameplay is good. There is nothing wrong to offer people a way to practice and improve their aiming skill with such a kind of learning curve. It's very OK. All the other classes have to aim by the way. And about the realism of being able to head bite from the floor, it's not a problem, the same way the medikit is totally unrealistic, nothing in real life can give you complete health after being almost completely eaten by a monster, the same way the human player is still being able to run at full speed while having been almost completely eaten by a monster. As I said on IRC, it's not a problem if knight class in chess game does not have to pee. So I'm against removing dretch head bite. The only problem of dretch floor headbite is being not obvious. That is what must be enhanced: makes the dretch floor headbite discoverable by people otherwise than luck or word of mouth. For example we can put a special feedback while aiming head or things like that. The dretch floor headbite problem is only a feedback and tutorial problem. Last edited by illwieckz on Wed Jan 17, 2018 12:34 am UTC, edited 1 time in total. So basically these 'cheats' make the skill cap higher? I can see your point, if that's the case. Why not allow it to become an integral part of the game, if it elevates it and doesn't completely break it.